Wood is biodegradable – that’s a characteristic we normally consider to be one of the benefits of choosing natural materials. Organisms exist that can break down wood into its basic chemicals so that fallen logs in the forest can contribute to the growth of the next generation of life. This process – essential in the forest – must be prevented when we use wood in buildings. A variety of fungi, insects, and marine borers have the capability to break down the complex polymers which make up the wood structure. In Canada, fungi are a more serious problem than insects. The wood-inhabiting fungi can be separated into moulds, stainers, soft-rot fungi and wood-rotting basidiomycetes. The moulds and stainers can discolour the wood however they do not significantly damage the wood structurally. Soft-rot fungi and wood-rotting basidiomycetes can cause strength loss in wood, with the basidiomycetes the ones responsible for decay problems in buildings. With regard to insects, carpenter ants only cause problems in decayed wood, and significant subterranean termite activity is confined to a few southern areas of Canada. However, other parts of the world have a serious problem with termites. Decayed wood is the result of a series of events including a sequence of fungal colonization. The spores of these fungi are ubiquitous in the air for much of the year. 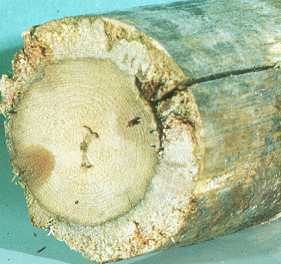 Wood-rotting fungi require wood as their food source, an equable temperature, oxygen and water. Water is normally the only one of these factors that we can easily manage. This may be made more difficult by some fungi, which can transport water to otherwise dry wood. It can also be difficult to control moisture once decay has started, since the fungi produce water as a result of the decay process. The outer portion of this log is being attacked by a decay fungus. Note that the damage is held back at the line between heartwood and sapwood. To understand why, click here to read about natural durability. Click Here for a 26-page paper on biodeterioration, including illustrations and bibliography.